Ok, Philadelphia Eagles fans may think nothing can top their team’s proud designation as Super Bowl champions, but we’ve got something for bookish folks that’s sure to please. On January 29, the Library Company of Philadelphia opened its latest exhibition to the public on sharing special collections in a digital world. Entitled #GiltyPleasures--a play on the word for gold-covered binding and illumination--the show is the logical extension of a social media initiative launched two years ago by Concetta Barbera and Arielle Middleman, the Library Company’s digital outreach librarians. Almost daily, devoted Instagram followers find postings ranging from century playing cards, watercolors, photographs, and recently, a slightly doctored WWI recruitment poster showing--what else--a bald eagle trouncing a black-feathered foe sporting Patriots insignia on its chest. Billed as the library’s “greatest hits,” #GiltyPleasures hopes to inspire visitors while celebrating the qualities of this institution founded by Benjamin Franklin back in 1731. Bonus: This week the Library Company is participating in #ColorOurCollections, a weeklong social media coloring festival where institutions share free coloring content with their social media followers, so break out a fresh box of crayons! #GiltyPleasures runs through April 6 and can also be viewed here. Ok, Philadelphia Eagles fans may think nothing can top their team's proud designation as Super Bowl champions, but we've got something for bookish folks that's sure to please. On January 29, the Library Company of Philadelphia opened its latest exhibition to the public on sharing special collections in a digital world. Entitled #GiltyPleasures--a play on the word for gold-covered binding and illumination--the show is the logical extension of a social media initiative launched two years ago by Concetta Barbera and Arielle Middleman, the Library Company's digital outreach librarians. Almost daily, devoted Instagram followers find postings ranging from century playing cards, watercolors, photographs, and recently, a slightly doctored WWI recruitment poster showing--what else--a bald eagle trouncing a black-feathered foe sporting Patriots insignia on its chest. "We wanted to share our passion for the Library Company's collections with the online community," Barbera and Middleman said. "We also wanted to introduce new and whimsical ways to engage with special collections. However, no virtual environment can fully mimic the experience of seeing and interacting with these materials in person, and we hope that #GiltyPleasures fills that gap." 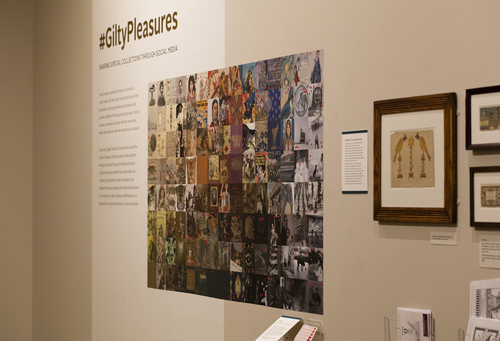 Billed as the library's "greatest hits," #GiltyPleasures hopes to inspire visitors while celebrating the qualities of this institution founded by Benjamin Franklin back in 1731. Bonus: This week the Library Company is participating in #ColorOurCollections, a weeklong social media coloring festival where institutions share free coloring content with their social media followers, so break out a fresh box of crayons!